The Richmond Art Gallery is delighted to announce that artist Greg Girard has produced a limited edition archival pigment print to benefit the Gallery. Girard’s work will be the subject of a solo exhibition, Greg Girard: Richmond/Kowloon, at the Gallery from April 18 – June 28, 2015. Organized by Curator, Nan Capogna, the exhibition comprises previously created work documenting Hong Kong’s renowned Kowloon Walled City and premieres a new body of photographic images of Richmond, BC and its residents. 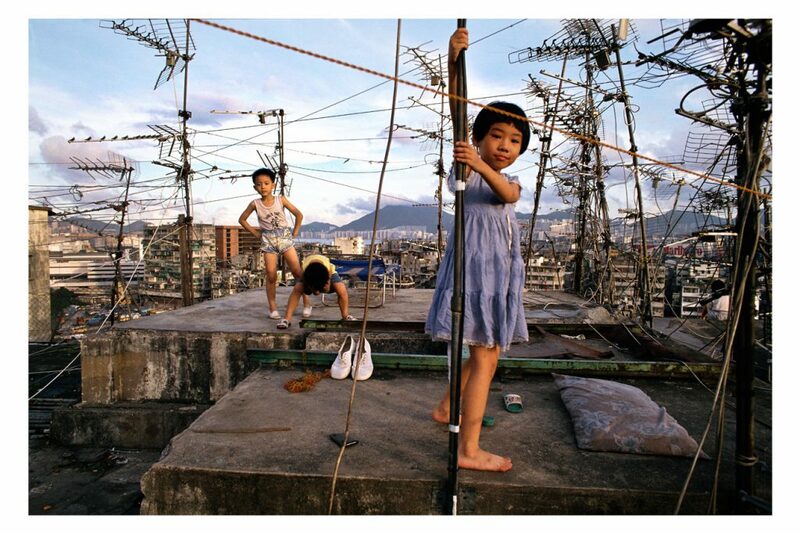 Children on Rooftop is from Girard’s Kowloon Walled City photographs. A singular Hong Kong phenomenon, the Walled City housed up to 35,000 people living in over 300 interconnected high-rise buildings covering one square city block in a densely populated neighbourhood forming a “city within a city”. Though demolished 20 years ago in 1993, interest in the Kowloon Walled City continues, fuelled in part by urban legends that persist about this extraordinary community. Greg Girard is a Vancouver-based Canadian photographer who has spent nearly 30 years living and working in Asia, mostly in Shanghai and Hong Kong. His work examines the social and physical transformations in Asia, especially in its largest cities. He is the author of several photographic books. City of Darkness Revisited, published in 2014, revives an early collaboration with co-author Ian Lambot, and updates their influential book, City of Darkness: Life in Kowloon Walled City (Watermark, 1993). His work is in the collections of the National Gallery of Canada, The Art Gallery of Ontario, the Vancouver Art Gallery and other public and private collections. Prints may be viewed at the Richmond Art Gallery. Prints can be purchased in person at the Richmond Art Gallery and online through Paypal (see Paypal link below). For more information, contact gallery@richmond.ca or 604-247-8363. Shipping available upon request at an additional cost. This “Buy Now” button will take you to a PayPal payment screen. You DO NOT need a PayPal account to make the purchase, but you do need a credit card. You can also call the gallery at 604-247-8310 for information on how to make a purchase.